Gold is great for increasing the blood circulation in your body. This helps in keeping your skin well hydrated and locks the moisture in your skin. Moreover, the tiny particles in gold get easily absorbed by the skin and this provides a rich glow to your face. As a result, your skin becomes healthy, radiant and fresh looking. When the elasticity f the skin is reduced or completely lost, your skin starts to sag. By using gold for treating your skin, you can reduce the breakdown of elastin. This in turn leads to the restoration of the elasticity in the tissues of the skin. So, use gold on your skin can prevent your skin from sagging and looking older. By increasing the elasticity of the skin, gold helps in making your skin get firm and well toned. As a result, no wrinkles or fine lines will appear on your skin. Gold is excellent for your skin and has the power to lighten the complexion of the skin. In history it was written that Cleopatra, the most beautiful queen of Egypt, used gold for her beauty treatment. She is said to have used gold mask every night. This helped in enhancing her complexion and also kept her skin young looking and glowing. When you skin gets dry, it may lead to premature aging of the skin. By using gold you can reduce dryness of the skin. Gold helps in increasing the metabolic rate as well. This in turn prevents your skin from premature aging and keeps it moisturized, young looking and supple. Every woman strives to get a clear skin that is free from any blemishes, wrinkles, fine lines and spots. Gold has the power to make the basal cells of the skin active and thus reduce the appearance of wrinkles and fine lines on the face. You skin becomes blemish free as well. As a result, you will have a clear and young looking skin that you will be proud of. Gold can increase the circulation of blood in your body. This is because the ions present in gold is very beneficial for stimulating he nerves, cells and veins in the body. This results in increased blood circulation. Increased blood circulation helps in increasing the metabolism of the skin cells and in flushing out all the waste from the body. 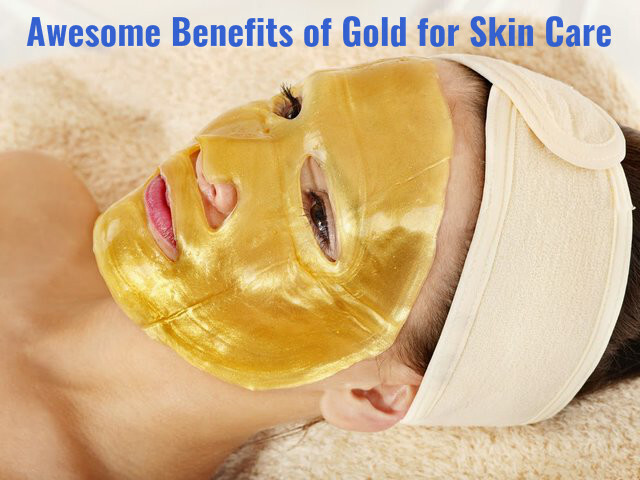 By stimulating the cells, gold helps in providing you a healthy skin. Collagen is produced in your body naturally. It helps in keeping your body flexible. Collagen is essential for having a smooth skin and hair that is shiny and beautiful. By the time you reach your mid twenties, the level of collagen starts to get reduced. This is the time when you start noticing some changes in your skin. If you take care of your skin with gold, you can reduce the depletion of collagen in your body and thus remain young and beautiful. We all are very careful not to expose our skin to the sunlight. Sunlight can tan your skin and make it appear dark in color. So, most people apply sunscreen lotion on the skin before going out in the sun and also carry an umbrella. Tanning of the skin is caused due to the production of melanin, which is a black pigment in the skin. By using gold for treating your skin, you can reduce the production of melanin in the skin and thus prevent and treat damage caused by the sun. According to the people of Egypt, gold also has a lot of medicinal properties. So gold can treat a few diseases as well. Gold has antioxidant properties, which help in increasing the circulation of blood in the body. This helps in reducing acne and in the treatment of many skin allergies. The anti-inflammatory and anti-bacterial properties of gold make it very beneficial for treating inflammation. It helps oxygen to enter in to the skin, so that the cells are renewed. This makes it excellent for treating ulcers and other inflammatory issues of the skin. Gold is also excellent for making your skin rejuvenated and fresh. Since gold is very expensive, treating your skin with gold is also an expensive affair. But the results that you get are worth the money spent. At the beauty parlor you can get gold facials and other treatments with gold. This provides you a radiant skin that is supple, smooth and rejuvenated. Face creams and skin polishes containing gold elements are now available in the market. So, you can see that gold provides you a young and beautiful skin with a fresh glow. It is also beneficial for reducing collagen depletion, increasing the elasticity of the skin, stimulating the cells of the skin and making the skin firm, lightening the complexion of the skin and improving the circulation of the blood. Gold also prevents premature aging of the skin and the appearance of wrinkles, fine lines, suntan etc. on the skin. So, use gold and enjoy the amazing benefits of gold. I have no doubts about the beauty benefits and other benefits associated with the Gold as history proves that Gold was really good for health and the reason of using gold and silver utensils was not just a luxury. Gold ash was used for various medicinal purposes, however I wonder how many of us will be able to use all these beauty benefits of gold in our life. Gold is not just costly but it is way too costly and wearing it as an ornament feels better than using it as skin mask or face pack for treatment of skin problems . Anyway, Is there are any beauty cream or serum that contain gold or even a fraction of it ?